Share my safari cost ! As we aspire to make you happy and serve you better, we are rolling out a new product to enable us serve you better and go on safari at slightly reduced price. Most of the requests we receive are for 2 guests (couples) travelling together which forces us to send cost for 2 people traveling together in a 4x4 Land cruiser. When you have two people travelling together alone in a 4x4 it implies that, the two customers will pay for the 4x4, Fuelling the 4x4 on safari, Drivers allowance to carter for the meals and drivers overnight stay , Entrance fees for the driver and vehicle to get into the park, ferry fees and Wi-Fi. All the costs outlined above remain constant if you travel 4 pax or 6 pax in the same 4x4. Our Main challenge as the safari operator is to confirm your safari if we haven’t received the sharing customers. We receive request differently and requesting to go on safari on different specific days. To serve you better we have come up with an idea of requesting our customers to give us some time and permission to get more Guests to share safari with them and go on a discounted safari if private safari is above their Budget. 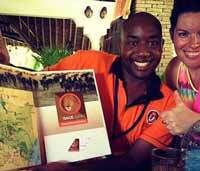 Once we get more guests to share the safari, we will collect a deposit and guarantee the safari. Once you book a sharing safari on a specific date we won’t allow you amend your booking in any way!! If you choose to cancel you’re booking to protect the other customers who have booked sharing we will be forced to retain a percentage of what you have paid to carter for the expense of the other guests who have booked sharing and enable them go on safari. The sharing safari can only be organized for Guests staying in Mombasa/Bamburi and Diani beach.